The LTER Network Communications Office developed this monthly webinar series to keep investigators across the community apprised of new developments from the LTER synthesis groups. Webinars are hosted by the LTER Network Communications Office and the National Center for Ecological Analysis and Synthesis (NCEAS). Each of the speakers will discuss the opportunity they perceived to develop new tools, resources, or theory; the gaps their work is intended to fill; and progress made to date. Often, groups are able to incorporate additional data sources, and would love to hear from sites that may not have been included in the original proposal. Presenters will also discuss the process of doing team science and what they are learning through their synthesis activities. Please join us for one seminar or the whole series. Webinars are the on the second Thursday of each month at 11 am Pacific Daylight Time. View the video and resource list. Stephanie Hampton is a Professor in the School of the Environment and Director of the Center for Environmental Research, Education and Outreach at Washington State University. Dr. Hampton’s research ranges from basic investigations in aquatic science using statistical analysis of large databases to broader applications of empirical evidence in environmental issues. Prior to joining WSU, she was Deputy Director of the National Center for Ecological Analysis and Synthesis (NCEAS) at the Univ. of California – Santa Barbara. Dr. Hampton is active in exploring methods by which the scientific community can more broadly engage in data sharing, data-intensive research, and open science. She currently chairs the NSF Biology Directorate’s Advisory Committee and serves on advisory boards for NCEAS, the Canadian Institute of Ecology and Evolution, and the Ocean Modeling Forum. Dr. La Pierre is a community ecologist with a research focus on the community and ecosystem responses to global change drivers. She completed her PhD at Yale University, studying the roles of nutrient availability, climate, and herbivory in driving grassland community composition and ecosystem function and did a postdoc at Univ, of California, Berkeley, studying how mutualistic interactions are impacted by global change drivers in the legume-rhizobia system. In 2017, Kimberly started as a Senior Scientist at the Smithsonian Environmental Research Center where her research builds upon her history of examining the effects of human activities on the environment upon which we all depend. Dr. Avolio is currently an Assistant Professor in the Department of Earth and Planetary Sciences at Johns Hopkins University. Dr. Avolio received her PhD from Yale University. Her dissertation explored the adaptability of the dominant tallgrass species Andropogon gerardii to increased precipitation variability. After her PhD, she was a Research Assistant Professor at the Univ. of Utah, where she investigated plant community assembly in cultivated urban ecosystems. She recently completed a postdoc at SESYNC where she was developing community change metrics for species rank abundance curves and synthesizing data from 100+ global change experiments from around the world. Dr. Wilcox is interested in how global change drivers – such as altered precipitation, elevated atmospheric CO2, and eutrophication – alter plant community structure and ecosystem processes. He is particularly focused on how global change can cause switches in dominant species, and how this feeds back to alter the sensitivity of plant growth and carbon cycling to these same global changes. To this end, Kevin blends mechanistic process-based modeling, statistical modeling, and experimental approaches to assess these phenomena at a range of spatial and temporal scales. Dr. Wymore is an Assistant Research Professor at the University of New Hampshire in the Department of Natural Resources and the Environment. His research aims to understand how organic matter and nutrients are retained and transformed in surface waters. Dr. Dee is an Assistant Professor of Conservation Science in the Department of Fisheries, Wildlife, and Conservation Biology and an Affiliate Fellow at the Institute on the Environment at the Univ. of Minnesota. Laura’s research falls at the interface of ecology and economics, addressing climatic, ecological and socioeconomic drivers of ecosystem services and their sustainable management. Laura completed a Ph.D. in Environmental Science & Management at UC Santa Barbara and a concurrent M.A. in Economics. She completed a post-doc at UMN, examining how climate change affects ecosystem services provided by boreal forests and management strategies to reduce those impacts. Laura is also affiliated with the Natural Capital Project at UMN. For more information, see my website: Lauraedee.com. Dr. Eric Sokol is a Research Scientist with the National Ecological Observatory Network (NEON) with a research affiliation at the Institute for Arctic and Alpine Research (INSTAAR) and the University of Colorado Boulder. He started out studying aquatic insects in streams and rivers, using computer simulations and spatial statistics to understand how aquatic insect communities vary across watersheds. He has applied similar approaches to study microbe, diatom, zooplankton, macroinvertebrate, and fish communities in the Everglades (FCE LTER); soils, streams and ponds in Antarctica (MCM LTER); built ponds in Baltimore (BES LTER); and in synthesis work using publicly available LTER data. 3) that disturbance can alter systems differently as environments change. This interactive webinar will present a refined conceptual model for synthesizing disturbance across systems with long-term social-ecological research. 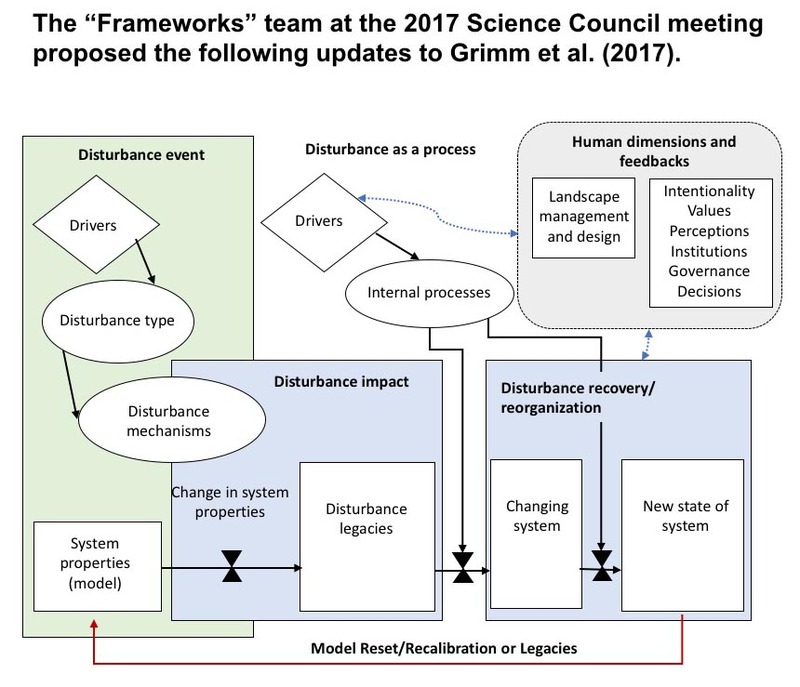 We will complete the conceptual diagram for a few illustrative systems, laying the groundwork for a broader workshop at the LTER All Scientists’ Meeting. In the process, presenters will illustrate the utility of the conceptual model for building site- level understanding of disturbance outcomes, and its potential for driving insights across different types of ecosystems.